We cover All Melbourne Suburbs, Melbourne North, Melbourne South, Melbourne Central, Eastern & Western Suburbs! Sealing your tiles and/or grout, helps prevent & reduce staining. It provides a barrier for a short time to remove the staining product, and helps reduce the damage caused from the stain itself. Staining can still occur if the staining product is not removed from the tile. Sealing will help to achieve better results when cleaning your tiles. TileCleaners team is well trained and very experienced in floor sealing, protection & restoration. Our long experience that we share along with our team will allow us to choose the best suitable sealer for your tiles, giving you the desired appearance for your tiles while paying the least amount possible. We have a long experience servicing schools, hospitals, clinics, bars, clubs, shopping centers and homes around the nation. We are your specialist service for tile sealing, stone sealing, grout sealing, lino/vinyl floor sealing and our service covers all suburbs within 60 minutes drive from Melbourne CBD. We use a penetrating sealer which allows the sealer to soak through the surface. In most cases we will be able to chemically remove your existing floor finish (sealer) and treat any staining and marks that will have occurred due to the ineffectiveness of your floor seal. When we are satisfied that we have achieved the best results possible, preferably by returning the floor to its natural state, then we allow a sufficient drying time before applying the needed number of coats of our specialist floor tile seal depending on the type of the floor. After any sealing job, we provide each customer with a simple tile maintenance program and complimentary sample cleaner to suit your requirements. Sealing of grout and porous tiles (such as terracotta, marble, polished porcelain, granite, travertine, limestone and sandstone etc) is necessary to protect them from premature decay and contamination. Even old tiles and grout can be cleaned and resealed to give them back a new lease on life! Sealing your porous tiles and grout provides reaction time to deal with spills. An unsealed floor can stain immediately, whereas a sealed floor is stain resistant with a reaction time of up to 4-5 hours. At TileCleaners we strongly recommend that any newly laid porous tiles be sealed immediately so the area gains the full benefit of the protection. Tiling is not an inexpensive exercise, so why not protect your investment? TileCleaners has the tile and grout cleaning & sealing solution to meet your tile maintenance needs. Can all types of tiles be sealed? If your tile is ceramic or porcelain, it probably won't need to be sealed. There are some exceptions to this, so check with your manufacturer to be sure. If your tile is stone (slate, marble, granite, travertine, etc.) then it will need to be sealed. Stone is naturally porous and will absorb spills and stain fairly easily. Why should i seal my tiles & grout? A lifetime on vertical surfaces. On floors, etc., it will last for years. However, on heavy walkway areas or heavily used areas such as shower recesses, the areas should be checked yearly and re-sealed if necessary. Can i seal the grout alone if my tiles cant be sealed? It is possible, but very time consuming. How often should floors be sealed? That will depend on the type of your floor, and type of use. and can range from yearly to every 10 years. This will on the type of sealer used, and usage. But sealers can last for years. How often should i completely reseal my tiles? We recommend removing old sealer completely after every 10 - 20 years. What type of sealer should i use for my tiles? Types of Protective sealers, Glossy / Shiny Sealer, Matte Finish Sealer. How many of coats of sealer do you put on my tiles? Between 2-4 coats. Depending on many factors, including the finish desired. How long does the sealer take to dry? Does sealing my tiles guarantee that they will stay stain free? After sealing, how long until the tiles can be walked on? After sealing, how long until i can return the furniture to the tiles? Does sealing tiles change their appearance? That depends on the type os sealer used, and the number of coats applied. Why should i get a professional to seal my tiles? How much does sealing my tiles cost? Does sealing make my tiles or stone maintenance free? Nothing is maintenance free! Sealing makes your surface easier to clean. Contaminants can sit on the surface longer, so you have more time to clean up before any staining occurs. On some unsealed tiles and stone, staining can start immediately. Think of your stone sealing product as a bottle of time. No stone sealing product will make a porous surface stain-proof, but will make it highly stain resistant. Using the correct stone cleaning products also makes a difference. Will sealing my pavers or stone stop algae growing? Sealing changes the characteristics of the tile or stone. It doesn't change the environment. If you have a damp shady backyard the stone sealing product can't change that. It reduces the porosity of the tile or stone and inhibits the growth and makes cleaning easier. In most cases it is worth considering. If I seal my grout, will it stay clean? No - not without the correct cleaning. Grout is the low point and often the most porous part of the wall or floor, and gathers the grime and residue from mopping. Sealing your grout makes it easier to keep clean. With a good grout sealer or colourant, you will get a much better result when you give your grout a good clean with the correct cleaner. The tile supplier said to seal my porcelain but my tiler said not to - why? The truth is porcelain is creating much confusion in the market place and many pages have been written to try to put all issues into perspective. The more questions you ask the more confused you will be. As a rule of thumb, textured and honed porcelain doesn't need to be sealed, but polished porcelain often does need to be. This is contrary to what may seem logical. The tiny pores that accept staining are created in the polishing process. A good penetrating sealer fills these pores and sets up good stain protection. The textured tiles generally just need a good clean because of the rough surface. If you are not sure, do a stain test. Get a sample tile or an off-cut and try to stain it with the things common to that area. If it stains, there is a benefit to having the tile sealed. My polished marble/limestone/travertine is sealed but still has marks - why? 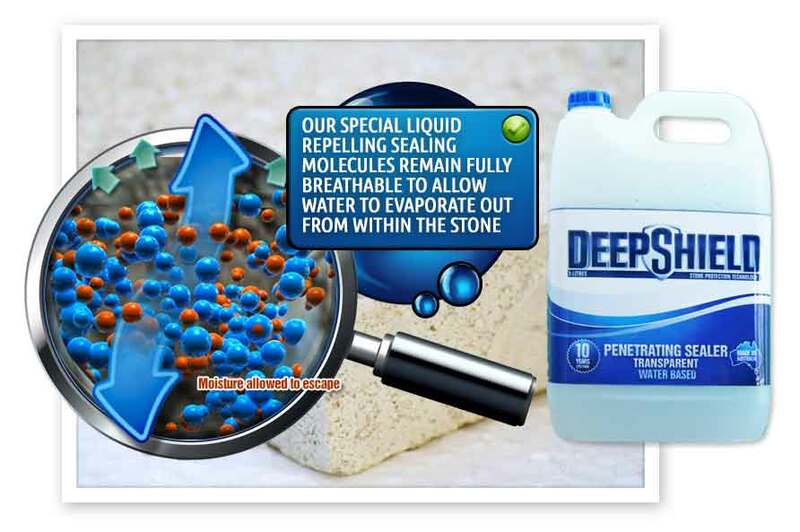 Penetrating stone sealing products protect the stone from staining. Often the �stains� are not stains but are etches. These stones are acid-sensitive, and any acid will burn the polish and create a dull or frosty surface. A good example is red wine. On an unsealed stone you will get a red stain and an etch, but on a sealed stone you will only get the etch. Penetrating sealers sit below the surface of the stone and prevent the red wine acid penetrating deeply to set up a stain, but will allow the acid to burn the surface. Acid can be in many forms, as simple as fruit or wine and salad dressings, or in the bathroom, urine may do the damage. This damage can be repaired. What guarantee do you offer with tile sealing? No guarantees are applicable to tile / grout sealing. Sealers come with a life expectancy of up to 15 years depending on the quality of the tile, traffic levels, maintenance procedures and so forth. It is important to realise that a sealer is not an impenetrable - - it provides reaction time to deal with spills. An unsealed floor can stain immediately, whereas a sealed floor is stain resistant and can have a reaction time of up to 4-5 hours. A penetrating sealer sits just below the surface of the tile and prevents spills from penetrating and hence staining the tile. It will not prevent acid based spills (eg red wine, vinegar, urine, fruit juice etc) from etching / burning the surface of the tile, creating a dull or frosty appearance. Spills of this nature should be cleaned immediately to prevent permanent damage to the tile surface. We use premium cleaners and sealers from leading industry suppliers including Sprit and Aquamix products as appropriate. How do I maintain my floors after they have been cleaned / sealed? The technician who carries out your cleaning / sealing will be able to offer maintenance advice specific to your tiled area. As a general rule, we recommend the use of a mild cleaner (such as Spirit �Neutral Cleaner�), at least weekly, to maintain you tiled floors. Tiles with a textured surface may benefit from the use of a doodlebug rather than a mop for a more effective clean. Avoid the use of harsh chemicals which will decrease the life expectancy of the sealers. Also, when mopping, make sure to change you water frequently, otherwise all you achieve is to spread dirty water around your floors! Will my floors look like new again? If your grout (and tiles if applicable) have NOT been sealed previously, it is possible that some staining, particularly in high traffic area's, may be permanent. If your grout (and tiles if applicable) HAVE been sealed previously, the dirt and other contaminants should have been prevented from penetrating and you may expect an excellent result from cleaning.